I meet so many people that only create change in their lives once something challenging happens to them. The experience creates that shift. Their lives turned upside down and back again to start anew. I’m also one of those people, a husband with brain cancer shifted my perspective. But why does it have to be this way? We wait until something bad happens to truly awaken to our purpose. I’d like to start a Human to Human movement. Where we bring about stories, experiences, inspiration to create the shift in mindset, eliminate judgement, and rewire our brains to awaken to this life. Once we start seeing each individual we pass on a daily basis as one of our own we will see the world as an interconnected breathing form. We will awaken to abundance, acceptance, and renewed energy. This will not only bring good into lives but it will create pause and allow people to start feeling rather than reacting. I believe if we lived like this the world would be a better place. 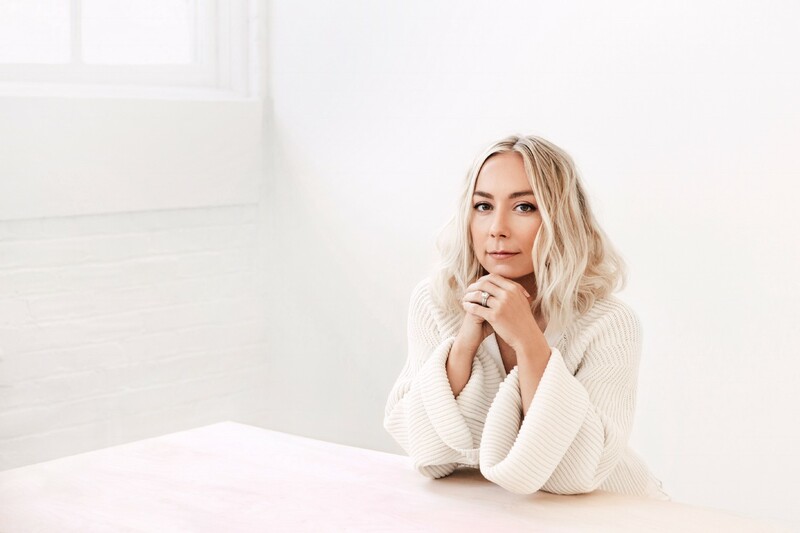 I had the pleasure of interviewing rising star and entrepreneur, Amy Duncan, Founder + CEO of Mowellens, a conscious health and wellness company. Amy balances life as a caregiver, launching a business, and maintaining her self-care regimen. She has experienced the industry of healthcare from many angles, medical device, biotechnology and clinical laboratory, and as a caregiver for her World Series champion husband after he was diagnosed with a glioblastoma brain tumor in 2012, a year after they were married. She now brings her career and business knowledge in all things health into the wellness industry. I grew up in a very traditional Midwest family. My parents have been married for 38 years, three sisters, all married with kids. I was the rebel child, always beating to my own drum. The list of “traditional” career path runs deep….my dad — Engineer, mom — principal of a Catholic school, sister(s) — Engineer, accountant, HR. Originally I wanted to be a pharmacist and that was gladly an acceptable choice. But when that path changed and my aspirations to be an entrepreneur and in “sales”….my parents looked at me like I had three eyes. And when that entrepreneurial drive turned into the start of health and wellness company, you can imagine the energy pushback I received from them. The evolution to start Mowellens came rather naturally, a culmination of my life, careers, and studies thus far. I’ve always wanted to work, had a drive I couldn’t put to rest, and held a job from the day I turned 16. Every position I’ve held, even at the bottle of the totem pole, I’ve made an effort to take a strategic look at the business and figure out how it operated, how it made money, how it fit into the ecosystem. I spent four years as a pharmacy technician and graduated college with a Bachelors in Business & Marketing and minor in Chemistry. It’s always been a balance of science and marketing for me. I have the capability of distilling down very complicated topics and making them simple, something the general community can understand. Dancing to the cupid shuffle in 2007 I met my now husband, Chris Duncan. He was a professional baseball player for the St. Louis Cardinals at the time. After graduating from college, I travelled around with him while he played baseball. We called it the Summer of Love Tour, travelling to nearly every major league stadium, cheering him on, and seeing 60,000 fans rise to greet him as he stepped to the plate. It made me proud of him. Looking back I see that I probably wasn’t the best girlfriend during that time. At the age of 24, most women are very much in discovery mode, learning who they are, who they want to become, and how they are going to get there. Chris had just won a World Series in 2006 and was comfortable in his skin and I was very much the opposite. The ambition in me was festering and I felt like a caged animal. This feeling was short lived as his body started to deteriorate and surgery after surgery put an end to his career. In 2010, I found myself back in St. Louis finding my first job in “sales” selling copiers and printers. It was my time to hustle…and I was ready. I took a job for Ricoh making $27,000 a year base salary. My first year I made $62k, proving to myself that I could sell. After two years at the top of the stack rankings the recruiters in healthcare started calling. Making the transition into medical device was not an easy leap. After a rigorous three month interview process, they passed on me, only to be called back four months later and asked to restart the interview process. I remember flying to Denver for the interview, the setting, a hotel lobby with the VP of Sales. When he met me in the lobby I stood up and shook his hand. In the most stern and steady voice I said, “I understand you have apprehensions about hiring me for the position as this would be my first in the field of healthcare. I am confident in my ability to succeed. My objective for this meeting is for you to leave this table without any doubts, knowing that I am the right person for the job.” He looked across the table and said “The job is yours. That is all I needed to hear.” It’s this mindset and the ability to step in at the right time that has catapulted my career forward. We all have it in us, but whether we tap into our potential at the opportune moments is what can make or break our journey. In due time it will happen, but how quickly it happens is predicated by these moments of execution. In the midst of selling physiological patient monitoring bedside monitors and telemetry, I dove deep into the business of healthcare. Studying healthcare allowed me to position the products to each stakeholder with everything from value based reimbursement and HCAHPS to invasive pressures and O2 sat to alarm fatigue. And just when things were settling into a groove, my world was uprooted. My husband started having petit mal seizures combined with numbness and speech arrest. We weren’t 100% sure what they were at first but after a quick google search we knew what we had to rule out, brain tumor. Everything else would have been okay. But unfortunately, ruling out this one diagnosis would prove to be a bit more challenging when his mother was diagnosed with a brain tumor just a year prior, a glioblastoma. We knew what we were in for and it wasn’t going to be easy. After a seven hour awake craniotomy, relearning to walk and talk, radiation, and a year of chemotherapy things started to seem somewhat normal again. The MRIs happened every four weeks and we lived our best lives in between then. Chris went back to work for the radio station, 101 ESPN, and I returned to work. We took a year of clean MRIs as our queue to get out of the cold winters and we moved to California when a promotion with my company presented itself. Genetics had always been intriguing for me with Chris and his mother both being diagnosed with glioblastoma brain tumors. We sequenced their exomes, performed hereditary cancer germline mutation testing, and tumor profiling only to find….well not much. But regardless, this field of study was calling me, and I took a not much. But regardless, this field of study was calling me, and I took a position as the Director of Sales & Marketing at a genetics laboratory specializing in pharmacogenetics. After the COO resigned I moved into the role and launched four new product lines in Hereditary Cancer testing, Carrier Screening, Non-Invasive Prenatal Testing, and Toxicology. Genetics was very personal to me and I was able to, once again, take something very complex and make it digestible for the masses. In the summer of 2016 the laboratory started exploring cannabis testing and I began the due diligence of exploring methodologies and equipment necessary for testing “clean” cannabis. In 2016 regulations for testing were just beginning and learning about products on the market that weren’t being tested created an unrest inside of me. I knew that if the product wasn’t tested it wasn’t safe for my family to use and I wouldn’t want anyone using it. It really ignited something in me. That and the fact that navigating the cannabis market for someone new to the space was rather challenging. Do you go to a dispensary? Do you buy on Amazon? What is hemp vs hemp oil vs hemp seed oil vs hemp extract vs CBD vs marijuana? A lot of information was overlapping and misconstrued. So I was dabbling in the plant at a pretty deep scientific level and was definitely interested in its potential. Then the worst happened….again. In October of 2016 my husband’s brain tumor returned. When we saw the regrowth on the MRI it brought back even more fear, anger, confusion, and sadness then the first time. When cancer returns it REALLY makes you question your life. I remember the many days…years really… when I rolled out of bed before my husband, left the house before the sun rose, and returned after dark. I wasn’t well, I never saw Chris, and this was my chance to make a change. I walked away from my position at the laboratory and decided to see if the wings I had been growing all these years could fly. To say Chris was shocked is an understatement. I remember his exact words, “What are you doing?” I’ve always been someone who doesn’t make big decisions big decisions. I don’t dwell on it or write out the pros and cons, I just wait until the decision that needs to be made comes to me. I’m very spiritual in that regard where I wait for this intuition to really say that’s what you need to be doing. It was a big decision in the grand scheme of life, but it didn’t weigh heavily on me. I thought, I made it this far in my career, I can make it wherever I want in the future, so let’s go. And what is better than betting on yourself? It wasn’t someone else’s money. I doubled down with the earnings from my career. It felt good that way. I saw an opportunity for someone like myself, with my background in healthcare and biotech, my experience as a caregiver, and being a normal female into health and wellness to pave that path and create a trust with the community by delivering products that are pure, clean, and have a purpose. So I converged all my experiences, collaborated with some of the greatest researchers and cultivators, fragrance alchemists, food and formulation scientists, and design experts….and Mowellens was borne. Going through life with my husband, living with awareness and empathy, has really opened my eyes to the small things that happen along the journey of building the company. Every day I look up and am grateful. Everyday some serendipitous encounter seems to happen to move the company forward. Whether you call it manifesting, visualizing, hustle, or being in flow…..it’s how I live and it has made my life, every day of it, interesting and enjoyable. When I was in the very early stages of the wellness industry and consuming content from various social media influencers, I compiled a list of women and wellness media outlets who I would love to get my product in the hands of. I really didn’t know how the world of influencer marketing worked but I read about it, listening to seminars, and of course heard about its success in catapulting a brand. After we launched, because of the mission, story, and design of the brand, the influencers and media outlets I compiled on that list started organically connecting with me and even ordering the product without encouragement or involvement from us. I watched as some of the people I admire for their content and connection with their community were now interested in sharing my company like I had watched them share others for years. From Jeanette Ogden (@ShuttheKaleUp), Chinae Alexander (@ChinaeAlexander), Joanna and Grace Park (@exercisewithextrafries), to US Weekly (12 CBD Hot Products), and Chalkboard Mag (8 Amazing CBD Products). We started to get noticed and I realized that putting the vision on paper was the first step in activating abundance and attraction. Another interesting manifestation experience came about just recently when I was at the beach over the weekend recharging with friends. I love working and the process of building something and so travel for me only comes when I feeling called to visit somewhere. I asked my friends the question, “If you could go on vacation somewhere right now, where would it be?” The answers flowed freely, eager to explore…..Greece, Madrid….and my response “The Maldives.” Something about crystal clear waters and unobstructed views of the sky puts me into a state of awe. Fast forward to Thursday of that week and Chris (my husband) wakes up in the middle of the night with a throbbing headache, unable to sleep. I roll over to scroll my feed and at 11:01pm (1’s are indicators of alignment) I receive a message from the Executive Chef of a luxury resort in the Maldives inquiring about using our products in their culinary program and spa. Conscious awareness and gratitude has changed my life and continues to change what experiences and people flow in and out of my life on a daily basis. My intention isn’t to use this skill (I do think it’s a skill) to bring in material or physical gains but rather to fulfill an overall life intention of freedom. It’s funny because I always have loved looking back at my journey retrospectively and seeing how the process and execution ended up manifesting into something tangible. Bringing an idea to fruition is extremely rewarding. When I look back at the beginning stages of formation, I posted a job description for a Formulation Scientist for a company that didn’t even exist yet. My background allowed me to hold my own in this space but I interviewed people to learn what I needed to bring a product to life, thinking I needed to bring someone on board. I found some extremely talented chemists who will eventually join the company when we shift into the medical space. But to take that step so early was definitely a funny mistake. I wouldn’t even call it a mistake though. The key is to execute and iterate frequently so that mistakes are merely stepping stones and not failures. This process of interviewing too early is how I eventually learned where we needed to be and I ended up outsourcing rather than onboarding. As a conscious health and wellness company, it is a combination of the core values and the community that make Mowellens, Mowellens. The connections to people and their families, products going to mom, dad, siblings, grandmother, aunts….everyone in the family. Our ability to be the bridge to pure, clean products that are universal and versatile in people’s lives. It’s really special. Of course people love the brand design but when they hear about our mission, our Grown for Good contribution, and my background it adds a layer of credibility to what we produce and why we do what we do. We are truly committed to pure, clean products and the ethical and sometimes costly decisions to stay true to this are apparent. Sometimes this commitment puts us on backorder, causes delays in production, and impacts our bottom line. But in the long run, this is a core value that we don’t comprise and it’s why we have such a loyal following. Self care, self awareness, and connection are staples in my life that ward off burn out. As a woman self-care means putting effort into my appearance and what makes me shine in my feminine energy. My skin, hair, nails, relaxing baths, meditation, workouts….they all contribute to my mental and physical well being and overall health. These things are non-negotiables in my life and if I don’t have a focus on them them my business will fail because my life will feel the negative impact. Self awareness allows me to pause, tune inward and check into what I need in the present moment. Connection brings play and perspective into my days. My circle of friends are amazing! They get me and they are my equals, my reflection. They love life just as much as I do and they all love the process. My husband has always been supportive of me and my ambitions and without him I wouldn’t approach my life — personal and in business — as I do. We’ve been together for 11 years and married for nearly 8. He has seen me evolve into the person I am today, and that can be challenging as my opinions and voice have also gotten stronger over the years. Having him by my side has taught me so many lessons in balance and life that I bring into business. Some of my partners have told me how kind and patient I am and that is attributed to my husband. Watching someone be at a peak in their life, winning a World Series, and then struggle with something such as cancer, and having that so close to me as I traverse my life and entrepreneurial journey, brings a unique element into my days running the company. Life is so precious and when life is at stake you value other things differently, decisions are made differently. Everyone associated with Mowellens, every employee, contractor, supplier, you name it….has the same core values. And if they don’t then I don’t do business with them. Our relationship and his strength has reinforced the principles in my life and enabled me to step into the women I have always envisioned myself being. From the initial formation of Mowellens the company and my individual focus on social responsibility was a high priority. We consume so many products and we don’t necessarily know where they come from, where the ingredients are derived, who is putting their time and effort into making them, and whether the environmental impact is a consideration. Granted, this is a challenging focus in the early stages of a company as remaining viable and ironing out the kinks is what pulls you. Creating connections with our partners and learning their story, mission, and values allows us to pass those vibrations into Mowellens. This could be through a family owned supplier, a small farmer, an eco-friendly bottle manufacturer or printing process, or even down to the employees of the organization who make the culture special. Education is the vehicle for change and we formed Grown for Good to not only make an impact in an emotional way but also to invigorate our community to share, shift, and rally around being an advocate for your own health. We donate $1 of every purchase to the Grown for Good fund and then reengage with the community to vote on where we allocate them, whether it be an event, cause, or diagnosis. Brain cancer is obviously a soft spot for me but overall health, plant based nutrition, epigenetics, and self-care are right up there in my book. Our community has their passions as well and this gives us an opportunity to connect on multiple levels and bring goodness to the world in so many ways. My favorite quote is “What would you attempt to do if you knew you could not fail.” As an INFJ I run the risk of going into a zone of analytical paralysis. Progress is what fuels me. This quote in my ear and on my desk staring at me keeps me moving forward. It is what allowed me to test my wings in entrepreneurship and what rings true when I look to make a change in life or shift the business. When I left the laboratory in 2016, my family was concerned about what was next for me. They thought I was crazy for walking away from something that was financially stable. But every day I went to work for the money. And when you truly believe you can accomplish something great and you have a vision for what that looks like, there is no reason you should not take the leap and attempt to do it without fear of failure. What is failure anyway? You can always get back up if you chose to. • Be adaptable and ready to make changes quickly. • Be relentless in your pursuit. • Continue to educate yourself as the industry evolves. We would love for Thrive readers to follow Mowellens on social media @mowellens and our web site is mowellens.com. I can be followed on social media @livingduncan.